I know what people mean when they say someone is a “self-made man” (I’ve rarely heard the phrase “self-made woman” spoken): a person who has risen from dire circumstances to success by hard work and ingenuity. Benjamin Franklin – the tenth son of a humble candle maker – printed, invented, flew a kite, authored, and became a great American patriarch. Frederick Douglass – the son of an unknown father (most likely his original master) and a slave mother – escaped slavery to preach, write, speak, and become a foremost abolitionist and statesman. These two giants of American history have exemplified the term in question for generations. Franklin I appreciate and Douglass I revere. The credo of hard work and ingenuity I wholeheartedly support. But the term used to describe Franklin’s and Douglass’s accomplishments – self-made? I’m not a fan of the term, nor do I ever use it. Franklin went to school until he was ten at a time when few did, and apprenticed under a brother to learn the printing trade. The wife of a subsequent Douglass master taught young Frederick to read (later, her husband coerced her to renounce this radical activity). Even though Franklin’s beginnings were humble and Douglass’s cruel and unjust, neither could claim complete freedom from the guidance and assistance of others. A community of some sort provided a foothold and direction. Later historical figures – Carnegie and Rockefeller – and contemporary figures – Oprah Winfrey and Nasty Gal proprietor Sophia Amoruso – fit the bill of achieving success while overcoming difficult circumstances. But again, none of these four could or can honestly say that they did it all on their own. Contemporary figures who have enjoyed business success, such as Ross Perot, Mark Cuban, Michael Jordan, Sean Combs, and Michael Dell all rose from middle class or upper-middle class beginnings. Little human beings need more caretaking and rearing than any other mammal. Newly born bears, orangutans, and elephants all require less time and effort to develop into adults than do newly born Olivia and Ezra (two of the most popular baby names in the US during 2016). When the raising up of our young ones is negligent or haphazard, catastrophes often result. Combine this proven reality with US society’s increasing inequality, and current troubles could ripen into future disasters. 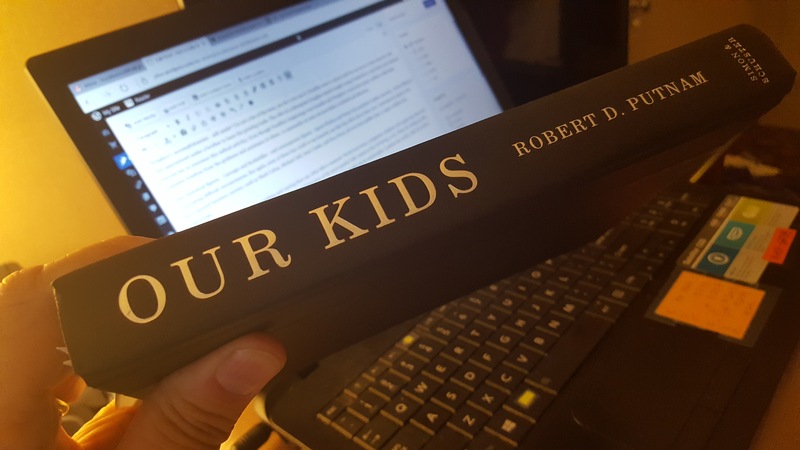 Robert Putnam, in Our Kids: The American Dream in Crisis (Simon & Schuster, 2015), joins many in the last few years to say that the phrase “self-made” has outlived its usefulness. Economic mobility in the US (the ability of a person to improve – or lower – their financial status) has not improved in the past fifty years. We no longer lead the world in economic mobility and many older Americans consequently overestimate its vibrancy. Other countries, such as Canada, France, and Denmark, boast higher rates of economic or social mobility than does the US. The cycle self-perpetuates: inequality makes the great American attribute of social mobility a myth because of its availability only to a minority. The majority of American males born today, for better or worse, will live into the same financial status of their fathers. For these, economic immobility is their American reality. Putnam advocates public policy and private citizen action to support all that can be done to raise up (a phrase of striking symbolism) children born into impoverished situations: investments social and financial in poor neighborhoods, establishment of more mixed income housing developments, and ending the pay-to-play aspect of extracurricular activities in public school systems. Simply relying upon an American attribute increasingly unattainable won’t make for a better society for the generations that come after us. Individual initiative emboldened by hard work and ingenuity is still an absolute necessity, but it must be manifested within the greater context of communal support and societal resolve. That today’s “self-made man” is a raging financial success who can live the life of ease and luxury is a clear bastardization of the term’s original understanding. In contrast, during Douglass’s day, the self-made man was a positive force in society for integrity, honesty, and love. The point of making money was not personal enrichment, but liberation from the necessity of work, freeing oneself to labor for the betterment of society. Jesus was not a self-made man. A strong mother, a supportive family, and an established communal tradition raised up, in the course of thirty years, a son who advocated the renewal of society based upon love of neighbor, forgiveness, and compassion – values representative of the coming kingdom of God. Additionally, Jesus criticized excessive trust in wealth, labeling it a worldly, not kingdom of God, attribute. What twenty-first century America needs: fewer “self-made” millionaires and billionaires who want to tell how they did it (so the rest of us can also strike it rich) and more citizens, be they rich or poor, who understand that strong and healthy communities produce the best and brightest individuals. I wasn’t the only one startled and stunned by the Trump onslaught of November 8th. While I whiffed on two very important details in my “Part 1” blogpost from October 20th – Trump wouldn’t amass more than 40 percent of the vote; and, accusations of sexual assault would doom him to lose the election convincingly – I didn’t whiff on the main point: the over-importance and overemphasis we attribute to wealth helped bring about the Trump candidacy and nomination, and now the Trump presidency. Trump becoming a good president lies within the theoretical realm of possibility. If Trump succeeds, it will result from good decision-making and discernment uniquely different from what he utilized as an American business colossus. Success for a presidential leader depends upon having social wisdom and the positive leveraging of relationships. Trump knows a thing or two about leveraging relationships from his business days and he leveraged successfully with a mostly white and non-college educated crowd during the campaign. His learning curve on social wisdom in twenty-first century America, however, is steep. Continuing to unite supporters in opposition to Syrian immigrants, Mexicans, Muslims, and issues like climate change only guarantees heightened conflict for his administration. Most major American cities will host in their streets protests against Trump on inauguration day, January 20th. The numerous organizations committed to social gains recent (LBGTQ rights, DACA/Dreamer enactments) and historic (women’s, voting, and civil rights) will fight against political leaders committed to turning back the clock, especially a leader like Trump whose vehemence against so many is public record. Trump’s wealth, however, has helped cover up a multitude of these publicly recorded sins. We Americans are a forgiving bunch, and we love us some rich and famous folk – even if they have a few quirks. Trump not only has as few quirks, he has managed to alienate just as many voters as he has attracted. Trump’s election portends victory for bigotry, misogyny, racism, nativism, and fear-mongering. Let me add one more to the list of unwanted victors: inequality. None of this is good, but there’s a nuanced reality beneath the surface of Trump’s victory. Inequality, ironically, is one of the reasons Trump won the vote. Let me explain. I have visited the laid-off factory workers and the communities crushed by our horrible and unfair trade deals (cheers). These are the forgotten men and women of our country – and they are forgotten, but they’re not going to be forgotten long. These are people who work hard, but no longer have a voice. I AM YOUR VOICE (raucous cheers). Bernie Sanders could have uttered these populist lines. 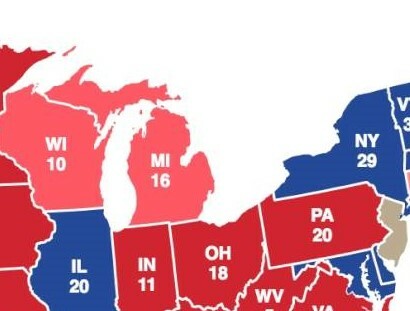 Trump beat Hillary Clinton in Ohio, Michigan, Wisconsin, and most surprisingly, Pennsylvania – four states that went in Barack Obama’s column in 2008 and 2012. These four states have white population majorities ranging from 79 percent (Michigan) to 86 percent (Wisconsin) – “racism and nostalgia” alone do not explain the swing of these states from Obama to Trump. Legitimate white working class frustrations and despair – related to three decades of increasing inequality, exemplified by greater social and economic immobility – explain better the switch in votes from Democrat to Republican. Obama championed change for these white working class voters in 2008 and 2012; Trump is now their guy in 2016. Kudos to President-elect Trump (and Bernie Sanders) for reaching out to them much more effectively than did Hillary Clinton. Inequality breeds social problems. Many majority white working class communities have suffered declines in jobs and social cohesion, and increases in rates of opioid and meth addiction. Along comes a candidate offering scapegoats (immigrants and globalization) and a solution (“I am your voice”) and the upshot is the most startling and stunning election result of our lifetimes. Our dual complicity in the Trump phenomenon: We overly revere the accumulation of wealth and we passively tolerate rampant inequality. Consequently, there continues to be a lot of work to do in this society beset by the consequences of deepening social and economic inequalities. For those of us who value and labor for societal common good, we will stand beside all those who feel threatened – Muslims, immigrants, LGBTQs, and minorities – in the new Trump era. We will also continue our work for greater social cohesion and understanding in and among America’s diverse populace. I’ve asked before in this blog: Do you have a friendship with anyone living in poverty? Now I can also ask: Do you know anyone who is working class? Now more than ever, it’s time for us to expand our social circles of understanding and cooperation. Now that we’re on the other side of the Bernie Sanders campaign, the claim that American society suffers from rampant inequalities is no longer a shocker. If anything, Senator Sanders’ candidacy proclaimed inequality as public enemy number one. He’s helped us understand that inequality in the US (and elsewhere) consists of three sub-categories: income, wealth, and opportunity. Income inequality is the most accessible of the three, revealed by comparisons in hourly wages, daily wages, and yearly salaries of workers. Income inequality is on the rise in the US, and has been for more than thirty-five years. To understand wealth inequality, consider that the Dow Jones Industrial Average recently crested 18,000. Climbing since July, the average has now hit an all-time high of more than 18,500. Are you among the 55 percent of American adults who own stocks? Before the 2008 “Great Recession” when the Dow Jones index fluctuated between 12,000 and 13,000, close to 65 percent of Americans owned stocks. Today, the pool of stock owners as a percentage of total population is the smallest it’s been in a generation, concentrating wealth. Increases in stock market indices generally mean those that already have plenty get more. A number of us (myself included) have retirement pensions and other holdings in the stock market. I fit the majority stockholder profile: white college grad living in a household making more than $75,000 per year. According to the Pew Research Center, 55 percent of whites, 28 percent of blacks, and 17 percent of Hispanics held stocks as of 2013. 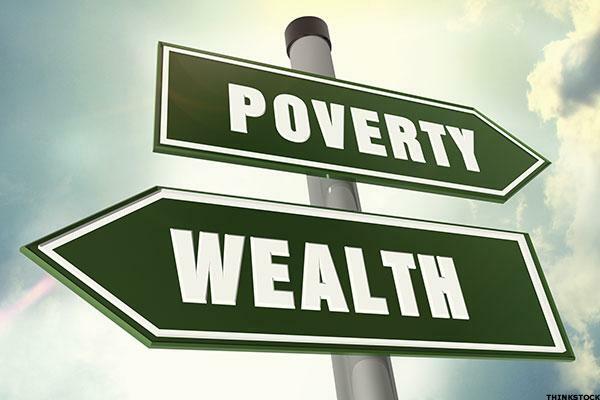 Financial market holdings, along with business and home ownerships are the main markers of accumulated wealth. The racial wealth gap has increased since 2008 in the US – whites have thirteen times greater wealth (overall assets minus liabilities) than blacks, and ten times greater than Hispanics. * Double or triple would be a significant difference – thirteen and ten times greater reveals a rigged system, historically and currently so. Economist, financier, and author Mohamed El-Erian best explains opportunity inequality in his book The Only Game in Town: Central Banks, Instability, and Avoiding the Next Collapse (Penguin Random House, 2016): “The worsening of income and wealth inequality has been so pronounced within countries that it now also undermines opportunities” (p. 84). In other words, as inequality continues to increase in the sub-categories of income and wealth, opportunities decrease. This explains why the great American tradition of economic and social mobility is morphing, especially during the past thirty-five years, into economic and social immobility. El-Erian, an American with extensive work experience worldwide, warns that the important role of inequality serving to incentivize and reward hard work and entrepreneurship now takes a back seat to excessive inequalities that harm society in many ways. We’re becoming stuck, and it’s not a good place in which to get stuck. El-Erian further details inequality’s tightening grip. Wall Street has recovered from 2008’s Great Recession. Corporate profits, as a share of GDP, have reached record highs in the post-Great Recession era. Job creation has improved, but wages remain flat. El-Erian says while the rich continue to get richer, “conventional cyclical redistribution policies have been noticeably absent. With active budget policy making heavily constrained by political polarization, there has been a reduced emphasis on transfer payments and other support for the poor” (p. 87). “Redistribution” – El-Erian knows that the use of the word is dangerous in today’s era of inequality. Since the first era of rampant inequality – the Gilded Age of the late nineteenth century – redistribution, however, has been an important tool to help make an unequal society a better society. Social Security, Medicare and Medicaid, Title 1 of the Education and Secondary Education Act, and Supplemental Nutrition Assistance Program (food stamps) are some examples of redistribution and transfer payments that specifically benefit the elderly and children in America. Without these programs, American society would be decidedly worse off. What kind of society do we want to live in? What kind of society do we want our grandchildren to live in? I’m all for continuing to advocate for a society that is egalitarian, civil, and full of opportunity with just rewards. And for those of us concerned that public administration is by design corrupt and inefficient? Yes, those in government need to be held accountable so that the above mentioned programs and other transfer programs are designed smartly and implemented efficiently. Hopefully, just as smartly and efficiently as have been the decisions and policies we’ve seen in the last thirty-five years to siphon income and wealth upward helping to create the trifecta of inequality that now threatens to destabilize our society. *For you curious types (like me), as of 2013, Asian-Americans have wealth stores that are 70 percent of the level of whites. Pastor Brad has been a passionate supporter of Just a Little Bit More from its very inception. Back in 2011, we lunched over gyro wraps at Phoenicia Bakery on South Lamar Boulevard in Austin. We sat on a picnic table outside in the hot fall wind (Phoenicia, abundantly stocked with Greek and Arab staples, doesn’t have indoor seating) and went back and forth about the 2007-08 economic swoon – and how our faith confronts what it has brought forth. Brad’s enthusiasm let me know that my thinking was on the right track. The culmination of a three-year process, Just a Little Bit More, was published in May 2014. My own congregation, St. John’s/San Juan Lutheran in Austin, and Brad’s were the first congregations to participate in a book study of JaLBM. We conducted the studies concurrently with the purpose of compiling feedback and notes that would contribute toward a study guide for other faith communities. I especially appreciate Brad’s comprehension and dissemination of JaLBM‘s message. Our faith does have something to say in mitigation of economic and social inequalities. Brad is absolutely “on point” in this video clip as he encourages others in faith communities to look into a book study of JaLBM. I first met Brad Highum when he was a student at the Lutheran Seminary Program of the Southwest (LSPS). While studying for ordained ministry (and previous to), he was serving as minister of adult education and programs at Riverbend Church in Austin. Brad is an excellent teacher and preacher. His scripture knowledge and recall are superb; his interpretation is progressive. His fluid articulation pulls in listeners to understand the message being shared. Pastor Brad’s got a quick wit, too. For the congregant at Abiding Love and others who are looking for an easier version of JaLBM to digest, the Summary Version and Study Guide is now available. Amazon and the Blue Ocotillo Publishing website offer it for $6.95 (52 pages); ebook version, $2.99. As stated above, Brad and the folks at Abiding Love (along with my folks at St. John’s/San Juan) helped shape the discussion questions at the end of all eight summarized chapters. Consequently, readers of the full-length version of JaLBM and the Summary Version and Study Guide can join in the same discussion with the purpose of “understanding how we got here” so that we might better – together – construct societal common good. 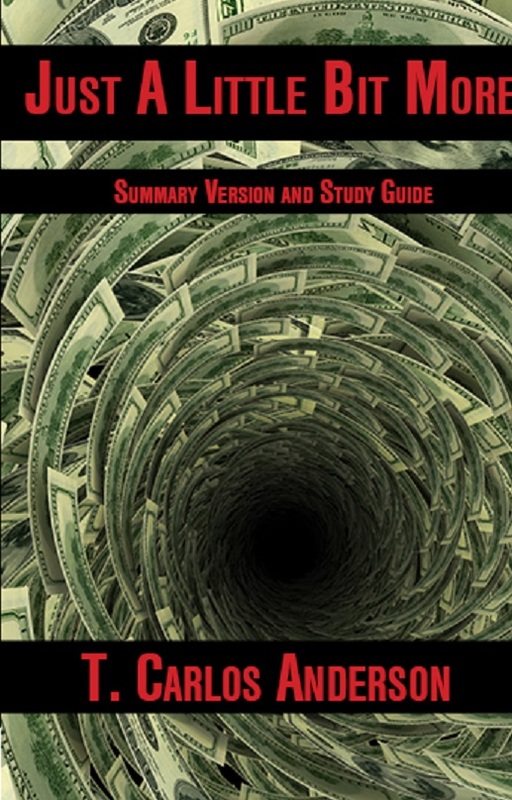 Just a Little Bit More: The Culture of Excess and the Fate of the Common Good – full-length version, 277 pages – is available wherever books and ebooks are sold.